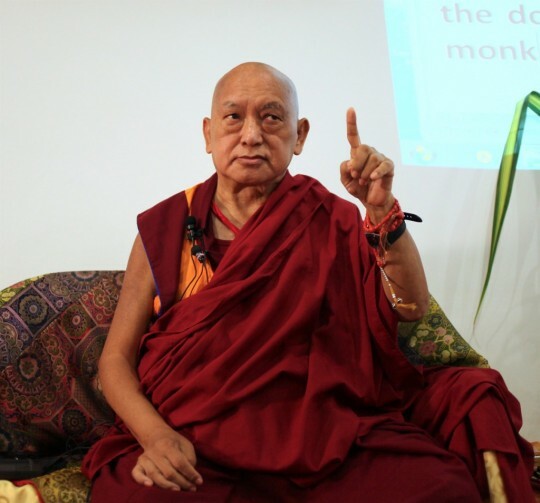 Lama Zopa Rinpoche teaching in Kuala Lumpur, Malaysia, March 2016. Photo by Ven. Lobsang Sherab. How are you? I hope you are well. I am sorry your arm is broken; I will pray for you. Your breaking your arm is to remind you of the shortcomings of being in samsara – it is exactly like a teaching that you must be free from samsara, liberated from samsara. It is another form of teaching. It is like the guru explaining suffering; it is like the guru reminding you of the suffering of samsara. Bad conditions – these are the guru explaining the nature of samsara and how you need to be free. The obstacles are persuading you to create virtue. Sicknesses and spirit possession are the broom cleaning away negative karma. Suffering is the manifestation of emptiness. Thank you very much! Take care of your life with bodhichitta, to make it the most beneficial for sentient beings. Even if you have only an hour to live or one day to live, make it the most beneficial for sentient beings. Thank you very much, I hope to see you soon! Scribed by Ven. Holly Ansett, Sera Je, India, January 2016. Edited for inclusion on FPMT.org.